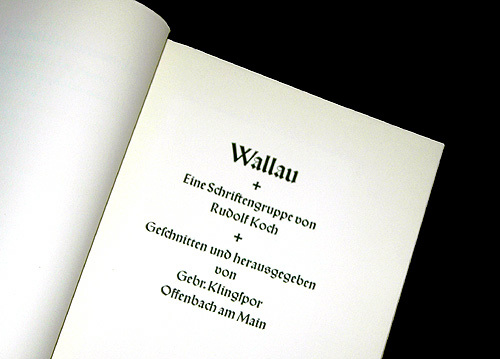 Die Wallau Schriftprobe — Blog — TypeOff. 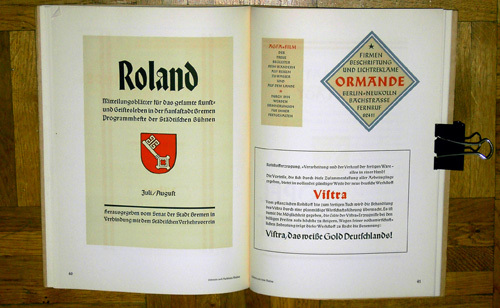 Between 1924 and 1930, Rudolf Koch designed the Wallau type family for the Klinsgpor foundry. Wallau is a rotunda-style blackletter face (rundgotisch) with two sets of capitals: a gothic (deutsche Großbuchstaben) and an uncial version. The gothic is quite “old-German” in its appearance, while the uncial works more like an odd Italian sans serif. 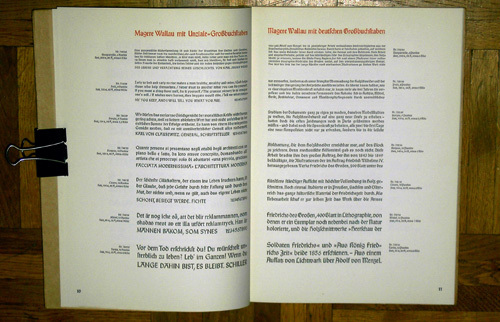 The Klingspor foundry released this 55-page Wallau specimen book in 1939. 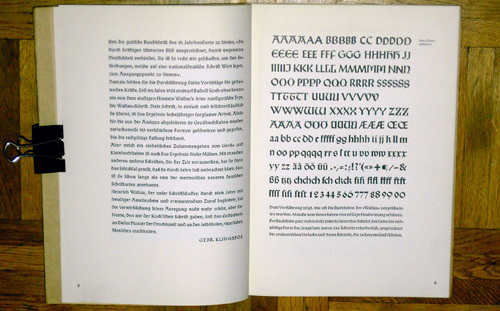 The typeface was named after Heinrich Wallau (1852–1925), a printer from Mainz. 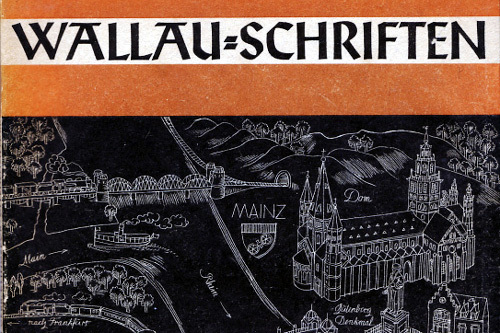 A beautiful line drawing of Mainz appears on the front cover of the brochure (shown above). A map of Offenbach appears on the back cover. In Letters of Credit, Walter Tracy wrote, “the quality of [the Klingspor foundry’s type specimens,] typography and printing has never been equaled.” This may be true, but I think that there are a few gems among present day type specimens: for instance, Linotype’s Sabon Next specimen (designed by Jean-François Porchez) is my favorite catalog of our digital era. I think that it can stand shoulder to shoulder—especially in terms of written contencontent—with the giants of the past. Here is a quick cover comparison with the Wallau brochure. Perhaps even more typographic, actually. 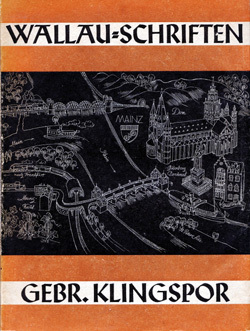 But this is an article about the Klingspor’s Wallau brochure. Enough of this sidetrack. 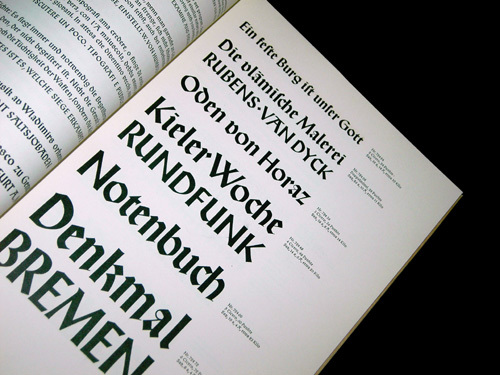 Unlike so many specimens, the old Klingspor examples really showed off their type. Generous white space surrounds the letters and text settings. 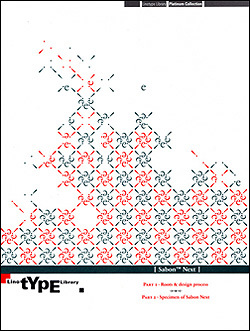 Inside the brochure, the typeface is shown at multiple sizes. This was even more important in that past than it is today, as the design of lead types would normally change slightly with the increase of point size. Very few digital type families have different optical versions available. Above, some sample headlines, showing the unical caps. The page above reproduces some of Koch’s sketches from the upper and lowercase letters. A close up of some of the sketches for the uncial capitals shows the array of forms that Koch tried out before coming to his final design. The brochure is filled with samples of advertisements and designed pieces that show how the typeface could be used. 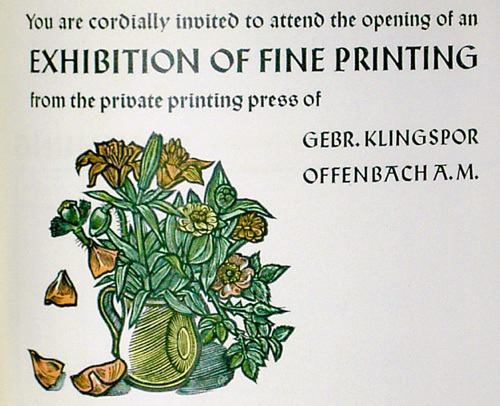 These pages are letterpress-printed, with multiple colors employed. 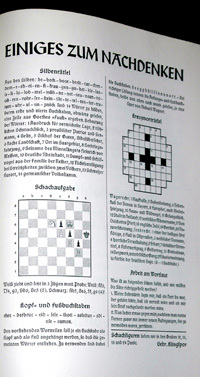 Klingspor specimen books often had some sample English-language showings. I think that Wallau is a typeface which could successfully be brought back into design use. For a blackletter design, its letters are considerably open and round. While it may not be the best choice to clothe contemporary text with, I think that it could set a mean headline. I particularly enjoy the chess and crossword puzzle sample at the end of the book. What a creative sample. 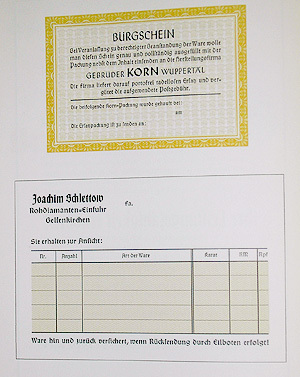 I purchased this specimen over ZVAB, through which many Klingspor items may be found at reasonable prices. 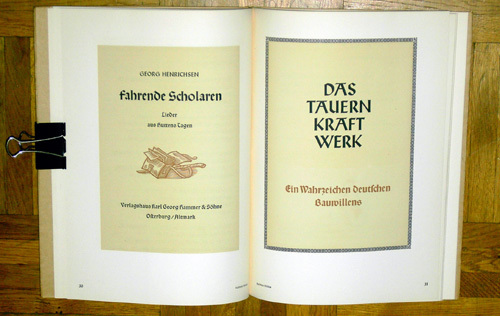 Images from a much earlier Koch typeface, the Deutsche Schrift, may be found in this entry.